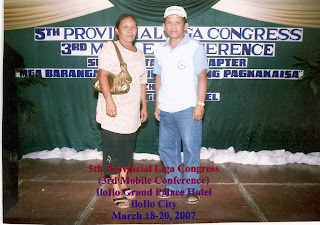 Looking back through the years, I can't imagine how I missed my parent's birthday. Today Phil. time is my Mama's 55th birthday. I can't help being very emotional when reminiscing my Mama's special day. Its been 4 years I was not with her every time she celebrated her birthday which I missed the most. Thinking about her today celebrating her birthday without me again makes me cry-:(. Ok I can't control my tears running down my cheeks now what more I can say, No One like my Mama. She's the best Mama in the world. I woke her up this morning her time greeted her a cheerful and bright Very Happy Birthday. We wished her good health and many more birthday's to come in the coming years. I am nothing in this world without my dearest Mama, she's the beat of my heart and the air that I breathe I thank the Lord for giving her another year to live for her life. She's more than a Mama, she's my Mama I can proud to be. Thank you for being a wonderful Mama to me. Happy Birthday MAMA! taken last year in Iloilo City. visited Boracay and other places. happy birthday to you mama dear! so nice of you to be so sweet like that! i'm sure your mother is so proud of you!